RRT* (optimal RRT) is an asymptotically-optimal incremental sampling-based motion planning algorithm. RRT* algorithm is guaranteed to converge to an optimal solution, while its running time is guaranteed to be a constant factor of the running time of the RRT. The notion of optimality is with respect to the distance function defined on the state space we are operating on. See ompl::base::Goal::setMaximumPathLength() for how to set the maximally allowed path length to reach the goal. If a solution path that is shorter than ompl::base::Goal::getMaximumPathLength() is found, the algorithm terminates before the elapsed time. 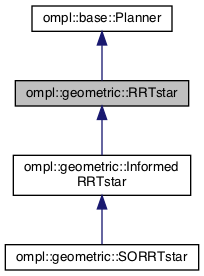 Definition at line 76 of file RRTstar.h. Definition at line 100 of file RRTstar.h. Definition at line 116 of file RRTstar.h.